The common weeds that can develop in the ponds on your property typically fall into three categories: growing beneath the surface, growing on the surface or growing past the surface. Recognize which category the weeds fit into and then observe certain aspects of the plants that can help you to tell what they are. Identify a pondweed called spatterdock by the size and shape of its leaves and the round yellow flowers. 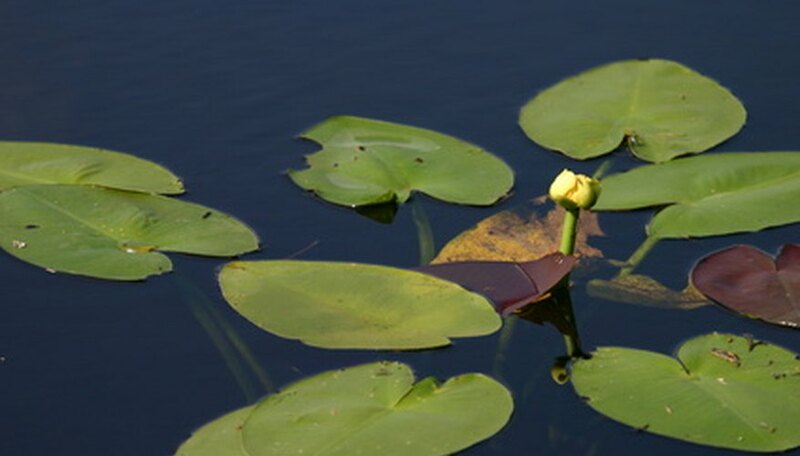 Spatterdock will grow up from the bottom and the oval leaves, sometimes shaped like hearts, can be as long as 16 inches and as wide as 10 inches. The compact flowers of spatterdock will have brilliant yellow petals and occur on a stalk above the water. Study the dark-green, rounded leaves of the white water lily to recognize this plant. The leaves, from 5 to 9 inches across, will float on the pond’s surface, with a few elevated a few inches above it. The leaves will have a distinct notch on them, attach to a stalk underneath that roots to the bottom and frequently be purplish on the under sides. The flowers are white to pink and aromatic, rising on a stalk over the water. Observe the very large leaves of the American lotus, which may be 3 feet in diameter. The leaves will either float on the top of the water or be as high as 3 feet over the surface. The flowers are a pale yellow shade and the middle, where the seeds exist, is spongy. Examine the roots of duckweed, a plant that can cover ponds from one end to the other. Duckweed is small, perhaps a 1/4 inch across at the most, and has round leaves in clusters of twos and fours. The under side will have from one to six roots attached to it. Duckweed floats freely and forms a blanket of green over the pond’s surface. Inspect the feathery roots flowing from the bottom of a water hyacinth. This weed typically floats on the surface, but in the shallow end of the pond it can take root in mud. Water hyacinth has a beautiful purple-to-white flower on a stalk as tall as 3 feet; water hyacinth cannot grow in cold climates. Look for leaves resembling ribbons and the cigar-shaped flowers of the cattail along the edges of a pond. Cattails may grow in water as deep as 4 feet, but most are right near the shore. Cattails can be as high as 8 feet and the trademark brown flower head extends above the green 1 inch wide leaves. Recognize hydrilla by how it grows beneath the water, rooted to the bottom. Hydrilla has branching stems, which on occasion will tear loose to form mats of floating vegetation. Hydrilla can grow in water up to 36 feet in depth, according to the Mississippi State University Fish and Wildlife Extension, with the upper leaves occurring in a whorled pattern around the stem in groups of threes.